You are about to take a virtual tour of my sister in law's flower gardens. They are something to behold! A riot of color from both annuals and perennials, sprinkled everywhere with whimsy! This flower bed has an abundance of perennials, including liatris in the right front corner, hostas, lilies, with zinnia and nasturium annuals. A salvaged brick edging and stone pathway. Another view of the north bed. Nasturiums, a bird house and a rusty electric fence sign. Fun bricks, tin and iron path. An iron arbor with climbing roses and brick edging. Fun with succulents and a gnome. Perennials and annuals mix beautifully in this area of the garden. Varied textures, colors, and foliage add visual interest. A calm puppy on a bench. Gorgeous pots on the patio. Clematis plant from her parent's home. A shade garden spot with hosta, impatiens and begonias. Dodge parts and a cool stool! A locker basket of pansies. Petunias in a laundry tub. 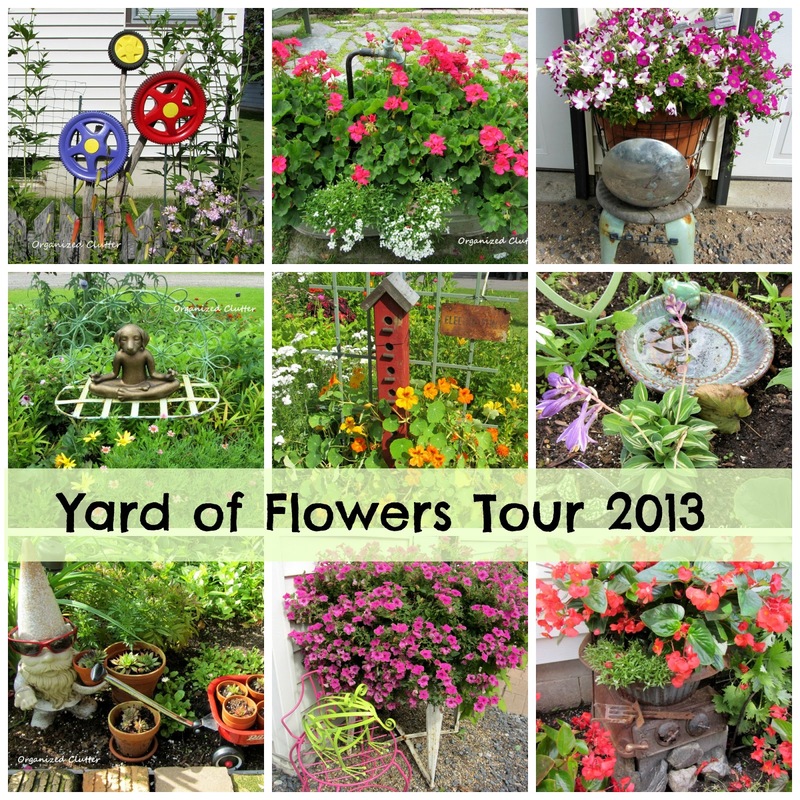 I hope you enjoyed this tour of the my sister in law's garden, better known as the "Yard of Flowers". The flower beds are amazing, wow the color is something to see...such an abundance of color and variety..love all the geraniums they are so lush..thanks for sharing the beautiful photos..
Oh WOW. It all looks so wonderful. How does she keep up with that? Well, she does an amazing job at it, that's for sure. Let her know she is more than welcome to come and play in my yard!!! Wow! Your SIL is a busy lady! Her "yard of flowers" is amazing and very impressive. I can tell she spends many hours in her gardens. She must live in a cooler climate than central TX. I'm envious! The bed of zinnias is stunning. I like the way she mixed the regular large zinnias with the smaller dwarf plants and then use alyssum for the border. Fun to see all the variety and the different whimsical touches she has added to the gardens. Thanks for sharing! Carlene, I forgot to mention that Alison @ The Polohouse is featuring gardens for Favorites on the First. You need to go over and link up this post. What a perfect mix of bright colors, and rustic salvage - she truly is a talent to be reckoned with, Carlene! Simply lovely garden! I wish mine would look like hers! So much inspiration. This was so inspiring! She is truly creative and has a wonderful garden! Unbelievable! I would not know how to get this much color in my yard! Beautiful! Wow! You have a fabulous garden. It must bring you lots of joy to work in it and sit outside! You really have a green thumb! It was so beautiful and calming. Thank you for posting! thank you for sharing. beautiful gardens with so much detail into them. 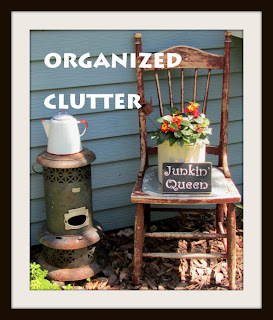 I like your organized clutter gardens. Thank you for sharing. Gorgeous and love the unusual genius of crazy material!